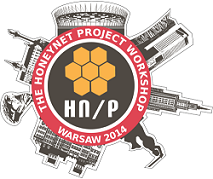 The Honeynet Project seeks sponsorship for the upcoming workshop to be held in Warsaw, Poland, 12-14 May 2014. Sponsorship is an excellent way to develop new relationships within the security community and provide a forum for sponsors to promote their brand message to the Honeynet Project members, presenters, and attendees. There are several ways to participate in sponsorship. As a part of our educational mission in the field of information security, the Honeynet Project encourages companies or organizations to sponsor student scholarships. Sponsoring a scholarship will offer an excellent student who are studying in this field for a free scholarship seat so that the student can attend the workshop Briefing and a Hands-on Training session where they will learn from worldclass security experts and trainers. A student scholarship can be sponsored at $475 USD. Contact us for more details. Sponsorship is not limited to packages, but can also take the form of provision of hardware, software, and other logistical support. Lunches and coffee-breaks for three days can be sponsored at $3000 and $4000 USD. The Networking event can be sponsored at the $6000 level.